March 2019 Update: This recipes cook temperature and quantities have been slightly modified. I’ve found the dough turns out better on a lower temp and I find the new ratio of flour to greek yogurt easier to manage. We’ve arrived at the time of year between Christmas and New Years where no one is really sure what day it is or what they should be doing. Maybe you’re still deep in holiday happenings or maybe you’re just relaxing until New Year’s Eve. 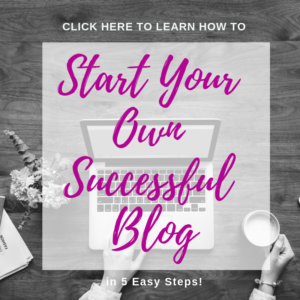 I have been enjoying my holidays with my little people and husband and I’ve been neglecting Fit and Frugal Mommy, until today! 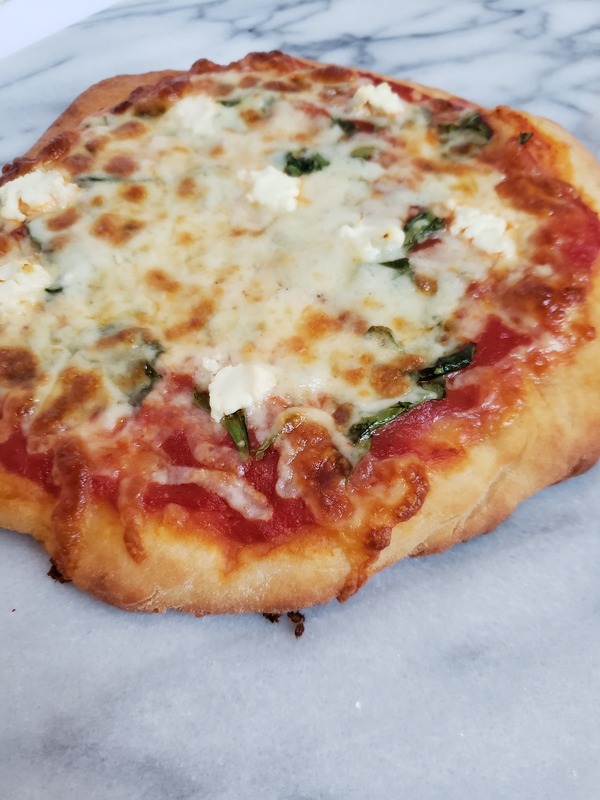 I recently tried a two ingredient dough pizza and WOW, it was amazing. It was sooo amazing, that I have to share it. This is not new or revolutionary. 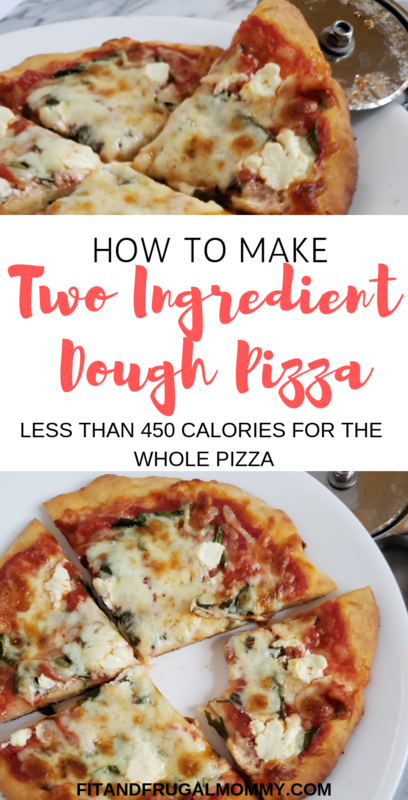 I love when things are easy to find in one location, so I’m bringing you two ingredient dough pizza to Fit and Frugal Mommy. I have some of my favourite variations of two ingredient dough pizzas below, with the individual calorie information. I’ve also included my new favourite, Copycat Domino’s Brooklyn Style. The ‘basic’ two ingredient dough pizza recipe can be found near the end of this post. One of the best things about this two ingredient dough pizza – besides that you can have the whole pizza for less than 450 calories – is that it has become a fun evening for my daughter and I. We have a make-your-own-pizza night where she picks all of her toppings and makes her own individual pizza. 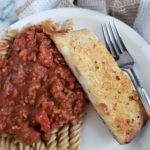 It’s lots of fun for both of us in the kitchen and it’s sooooo much cheaper than ordering in! 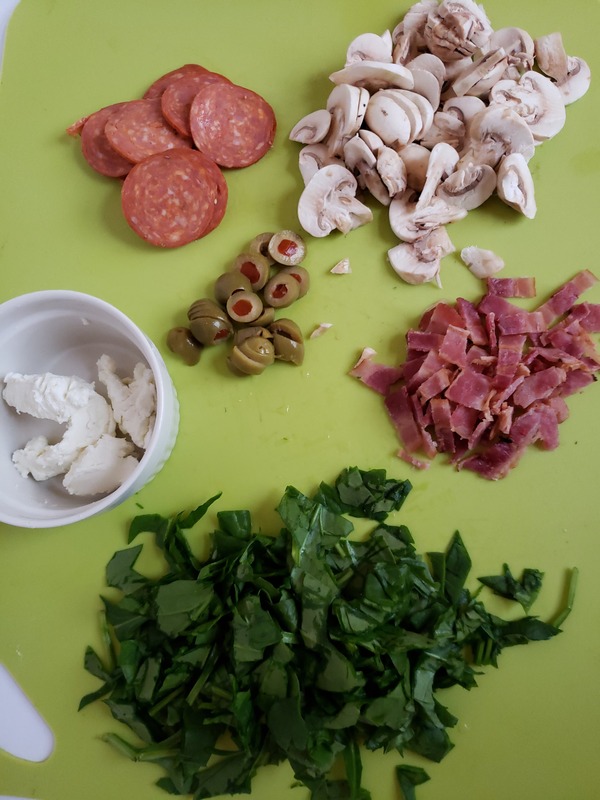 Mom Tip: I found it way easier to have all of my toppings chopped and the dough prepared before everyone came in to make their own pizza. The first time I did this I chopped toppings on the go and that was much more stressful! On each two ingredient dough pizza, I put 2 tbsp of no salt added crushed tomatoes for sauce. I tend to use crushed tomatoes over spaghetti or pizza sauces because of my time with Weight Watchers. At the time, using a can of spaghetti sauce was X number of points where crushed tomatoes were considered a zero point food. With no added sugar or salt, they are a great alternative to regular pasta/pizza sauces for a fraction of the cost. 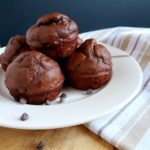 What if I don’t have self-rising flour? Add 1/4 cup + 2 tbsp of plain greek yogurt, italian seasoning and 1/2 cup of the self rising flour in to a bowl. Mix together with hands. If the dough is sticky sprinkle some additional self rising flour onto the dough and work it in. Continue to do this until the dough is less sticky and easier to work with. Sprinkle your marble pastry board with self rising flour and flatten the dough out on it, pushing the dough into a circular shape. Using a rolling pin, flatten the dough evenly. Flip the dough over and roll the other side. If you’re making the Copycat Domino’s Brooklyn Style, make sure to roll the dough out very thin. Place the pizza dough on a pan lined with parchment paper. Brush the tsp of extra virgin olive oil over the dough. This is optional, but gives the dough more of a takeout feel, it will add 1 smartpoint. Spoon the 2 tbsp of crushed tomatoes onto the middle of the pizza. Spread evenly around the pizza, leaving an inch from the edge of the dough to the sauce. This will become the crust once baked. Add your toppings as desired. Sprinkle the pizza with 1/3 cup shredded mozzarella. Bake for 16-18 minutes or until pizza crust is golden in colour. Allow the pizza time to cool before cutting and consuming. 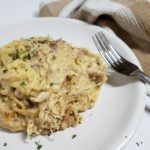 Want this recipe in an easy to read, printable format? 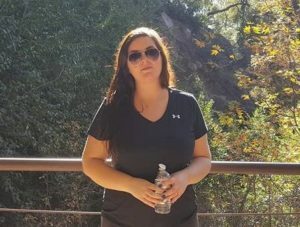 Keep on scrolling, it’s at the bottom! 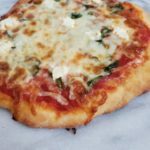 This is my absolute favourite two ingredient dough pizza and my absolute go to! I absolutely love goat cheese and sprinkling a little spinach for the extra nutrition! When I am feeling like I want something with a little more nutritional value, I will pack on the veggies! What’s your favourite pizza toppings? Let me know in the comments below! 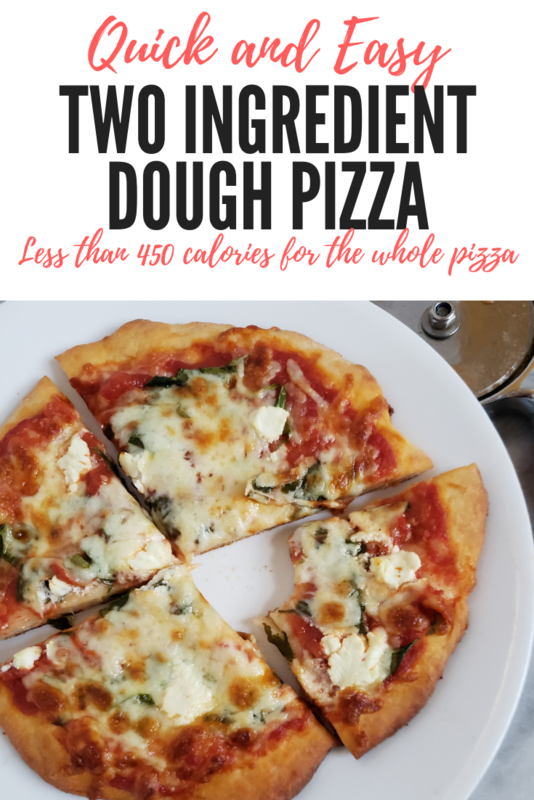 The delicious two ingredient dough pizza. 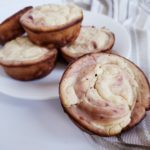 A healthier alternative to a delicious family favourite. Add 1/4 cup + 2 tbsp of plain greek yogurt, italian seasoning and 1/2 cup of the self rising flour to a bowl. Mix together with hands. If the dough is sticky, sprinkle some additional self rising flour onto the dough and work it in. Continue to do this until the dough is less sticky and easier to work with. Using a rolling pin, flatten the dough evenly. Flip the dough over and roll the other side. Place the pizza dough on a pan lined with parchment paper. Optionally brush the 1 tsp of extra virgin olive oil over the dough. This will give the dough more of a takeout pizza feel. 8 WW Freestyle Smartpoints | 349 Calories, Carbs 51.2g, Fat 8g, Protein 20.2g per whole pizza. 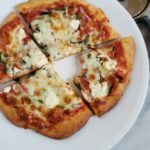 The calories listed for this recipe is for the base pizza recipe and ingredients included in this list. Additional toppings will modify the number of calories per pizza. The spinach and goat cheese pizza sounds amazing! Definitely gonna have to try this. And I love how simple it is! Made this recipe the other night for my other half who is an unbelievably great cook himself; he and I both were impressed and loved the pizza!